The Cross Florida Barge Canal, now officially the Marjorie Harris Carr Cross Florida Greenway is a protected green belt corridor, one mile (1.6 km) wide in most places. It is named for the leader of opposition to the Cross Florida Barge Canal, a canal project to connect the Gulf of Mexico and the Atlantic Ocean across Florida for barge traffic. Two sections were built but the project was cancelled, mainly for environmental reasons. HISTORY: The idea of such a canal was first proposed by Philip II of Spain in 1567. It was repeatedly considered over the years but found to be economically unviable. Secretary of War John C. Calhoun once again proposed a canal in 1818 in order to solve the losses due to shipwrecks and piracy. The Florida Railroad, finished on March 1, 1861, served a similar purpose, connecting the Atlantic Ocean at Fernandina to the Gulf of Mexico at Cedar Key. In the 1930s, regional politicians lobbied the federal government to fund canal construction as an economic recovery program, including the creation of the Canal Authority of the State of Florida in May 1933. President Franklin D. Roosevelt allocated $5 million in emergency funds in 1935. Local opponents of the canal protested that the canal would deplete Florida's aquifers, and work was stopped a year later. Work was reauthorized in 1942 as a national defense project, with dams and locks to protect the underground water supply. Support for the project from Washington was sporadic, and funds were never allocated to USACE to actually start construction. Planning was once again given the go-ahead in 1963 with support from president John F. Kennedy, who allocated one million dollars to the project. The next year, Lyndon Johnson set off the explosives that started construction. 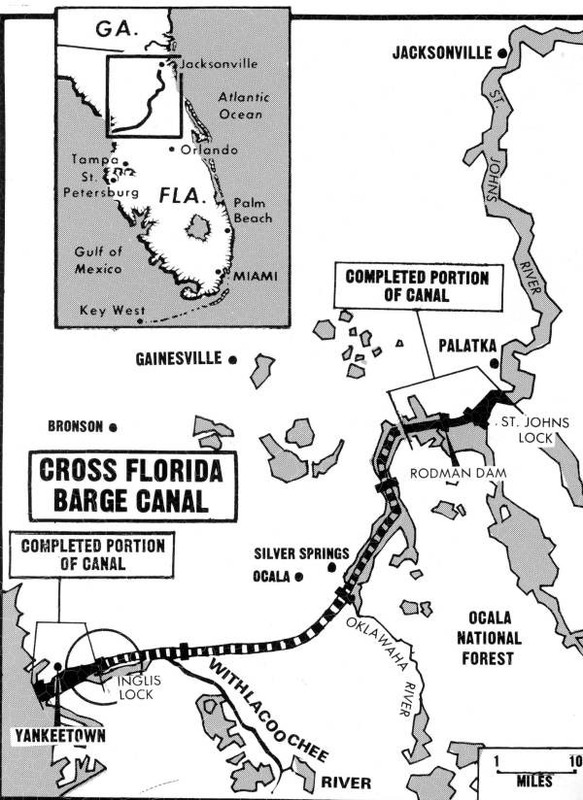 It was hoped that the canal, along with the St. Johns-Indian River Barge Canal, would provide a quicker and safer route across Florida by 1971. Opponents subsequently campaigned against the canal on environmental grounds, and the project halted again on January 19, 1971 by President Richard Nixon's signing of an executive order. Approximately $74 million had been spent on the project up until the 1971 cessation of activities. It was officially cancelled in 1991. In 1998, the right-of-way was turned over to the state and became the Marjorie Harris Carr Cross Florida Greenway, named in honor of Marjorie Harris Carr, who had led opposition to the canal. Carr had died the prior year at age 82. CANAL ROUTE: The planned route of the canal followed the St. Johns River from the Atlantic coast to Palatka, the valley of the Ocklawaha River to the coastal divide, and the Withlacoochee River to the Gulf of Mexico. About 28% of the 107-mile (172 km) project was built—the cross-country section 29°32′15″N 81°44′48″W from the St. Johns River to the Ocklawaha River, part of the route along the Ocklawaha, and a small section 29°00′46″N 82°39′54″W at the Gulf of Mexico end up to the dammed Lake Rousseau.